What does Customer Centric actually mean? Puts customers above everything else. Enhances the buyers experience, promotes sales and works to ensure customer loyalty, above all. 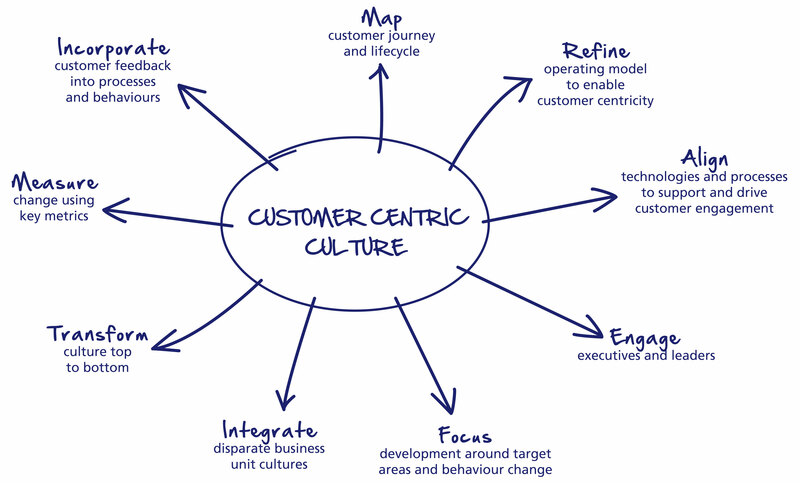 Here’s my list of seven steps for creating a customer-centric culture at your company. These figure in my work as a company culture consultant; I’ve found them to be central to creating a corporate customer service culture that’s devoted from top to bottom to the customer experience. I am recapping the list here at the request of a MarketHive reader; I hope you find it useful. 2. Elaborate on your central philosophy with a brief list of core values – a list short enough that every employee can understand, memorize, and internalize it, yet long enough to be meaningful. Your core values should cover how customers, employees, and vendors should be treated at all times. 4. Make it visual. The above-mentioned Ritz-Carlton has ‘‘credo cards’’ – laminated accordion-fold cards that each employee carries during work hours. The brand’s entire core beliefs, plus shared basics of guest and employee interactions, fit on that card. Zappos highlights one of its core values on each box it ships out. And sometimes ‘‘visual’’ doesn’t mean words at all. One way that FedEx shows that safety is a core value is via the orange shoulder belts in its vans: Everyone can see – from twenty-five yards away – that the driver’s wearing a belt. 5. Make your philosophy the focus of orientation. That way, if safety is one of your core values and you stress this at orientation, on day two, when the new employee’s co-worker tells him ‘‘In this restaurant, we stack the high chairs in front of the emergency exit when we need more room to do our prep work’’ [This is a real-life example, unfortunately], the new employee will experience cognitive dissonance and work on a way to align the actions of the company with the core values they’re supposed to reflect. 6. Train, support, hire, and, if necessary, use discipline to enforce what’s important to you. A core values statement is two-dimensional until you bring it to life – with the right people and energetic guidance. ‘‘Maintaining a culture is like raising a teenager,’’ says Ray Davis, President and CEO of Umpqua Bank, a the Pacific-Northwest-based U.S. retail bank that’s consistently top rated for service. ‘‘You’re constantly checking in. What are you doing? Where are you going? Who are you hanging out with?’’ And, sometimes, you have to use some tough love when that teenager is acting up in ways that don’t support the culture you’re working to build. 7. Include the wider world. Your people want to be part of an organization with a sense of purpose. Pizza parties and overtime pay (and even, believe it or not, stock options) only go so far. More inspirational: A version of a corporate “triple bottom line,” such as Southwest’s “Performance – People – Planet” commitment and annual report card. Or Ritz-Carlton’s “Community Footprints” social and environmental responsibility program. Or the story Umpqua Bank Regional VP Michele Livingston shared with me, about her employees visiting the homes of disabled customers to help them fill out their paperwork. Now that’s really something. See MarketHive for more information and to register. As I was brainstorming ideas for my last post on the MarketHive blog, I started reflecting on what I’ve personally learned during my time at MarketHive. My writing process is considerably different today than it was when I joined MarketHive over 2 years ago, so hopefully you can find some nuggets in the mistakes I’ve made and the lessons I’ve learned that might help you as well. When I first joined MarketHive, I wrote or sourced the content, published it and promoted it all. 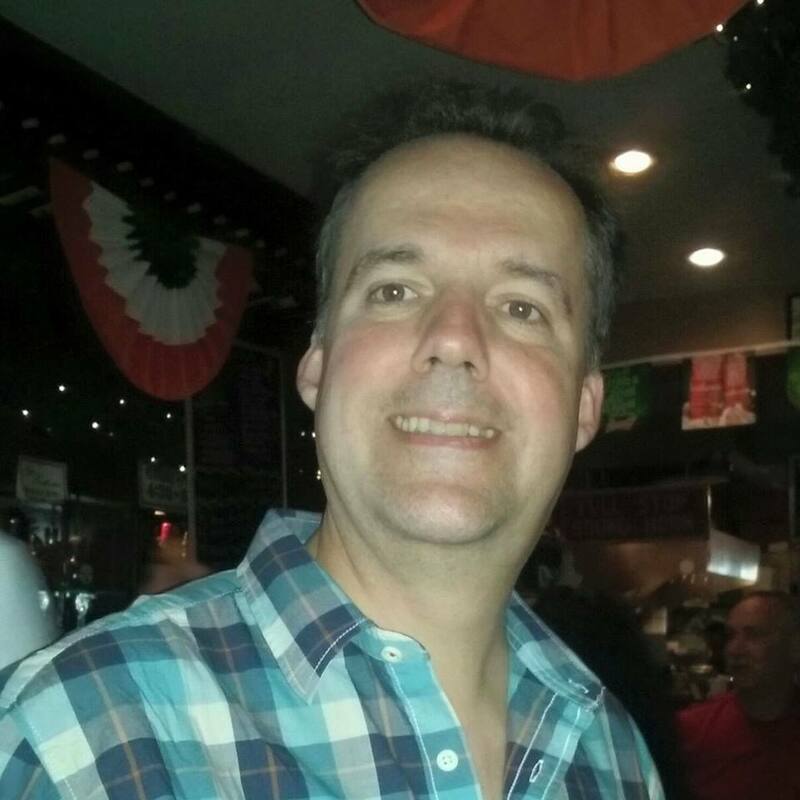 I approached blogging from almost exact opposite ends of the spectrum; Others are great at getting something up quickly and tweaking it to fit, whereas I was prone to spend a long time on my “first draft,” which was more like a fourth draft by the time I eventually sent it over for Paul to look at. Depending on the style of the blog post and the topic, I would take 1-2 full days to write a post for the MarketHive blog when I first started. I remember thinking how silly I was to underestimate my writing time: in my interview with Paul, I estimated that I could write one post per day, but it probably took six months before I got to that point. I made a few mistakes on a regular basis in those first months. One was to research too much, which hurt me in two ways: one, I had too much information collected about a topic that I wanted to squeeze into a 1500-word piece. I would either struggle to leave out research which I found interesting, or squeeze it in so that I ended up with upwards of ten different sources for one blog post. The second way this hurt me was simply by taking up too much time. Paul Graham wrote a great essay about how we spend our time. He says that sitting on a couch all day watching TV is so enjoyable and unlike work that it sets off our alarm bells pretty quickly. Most of us would struggle to get through a whole day of that without feeling really bad about wasting time. When you do “busy work,” however, it’s not that much fun and it looks a lot like work. Emails are a good example: you’re sitting at your desk, using your computer, and you’re not having fun, so you’re probably working. Only, you can get through a whole morning of emails and look back to realize you didn’t get anything important done. That’s what research can be like. Particularly on a topic I don’t already know much about, I tend to get sucked in to reading everything I possibly can about it before I start writing. For a journalist that has months to complete a piece, that might be feasible—and even admirable. But for a blog that’s aiming to publish a new post every day, there’s no time for research beyond the minimum you need to explain the topic to your readers. Another thing that slowed me down to begin with was managing my workload. Working full-time at MarketHive meant I had other tasks to do aside from writing blog posts: helping out with projects in other areas of MarketHive, working on emails to our customers to announce new features, answering blog comments and more. For a long time I struggled to find a balance between the different types of work I needed to do. I have some ideas about this which I’ll come back to later. Something I love about the MarketHive culture is the emphasis on self-improvement: not only by simply doing things we know are good for us, like exercising more, but also through experimentation. I’ve done several experiments on my workflow and my daily routine over the past nine months to eventually arrive at what seems to be working well for me now. Originally, I worked from around 8 a.m. or 9 a.m. until about 4 p.m. or 5 p.m.—a regular workday. When I realized I had a lot of work to get through besides my blog posts, I tried pushing my blog posts up to the top of my to-do list each day, working on those before I did anything else. I often fell into the trap of moving on to smaller, easier tasks like answering emails or blog comments, just to check some things off my list, and my blog posts would still take a couple of days to get done. Not only did this process slow me down, I felt pressure a lot of the time: either because I had so many things on my task list that I hadn’t started, since I was working on my blog post first, or because I had a whole blog post to get done that I was ignoring to work on smaller tasks. I had always thought I was a morning lark, who worked best before lunch. A few months ago I realized that I didn’t know this for sure, and I’d actually noticed I was working in solid, focused blocks right after lunch many days. So I tried a new experiment: I worked on my own startup before lunch and started my MarketHive workday at 1 p.m. This worked to a point, but I found that if I wasn’t done for the day by around 6 p.m., my energy started to wane and I struggled through the last part of my day. At various points in my time at MarketHive I also tried working until 10 p.m. at night, and starting at 6 a.m. or 7 a.m. to get a head start. I tried blocking out distractions, working in coworking spaces or at home by myself, working in silence or with various types of music. MarketHive’s culture really encourages this type of experimentation, and we’re lucky that we have a supportive team to share our progress with. I’d highly recommend trying this yourself if you’re struggling with productivity at work. Depending on whether I’ve got edits waiting to be done on my last MarketHive post, I’m usually done for the day by lunchtime or just after lunch. The high of taking my lunch break knowing my day’s work is done is huge. I originally got the idea of working until noon from Sean Ogle. I was fairly skeptical that it would work for me, but I’ve been pleasantly surprised that I’m generally able to focus on one task (writing a blog post) for a solid four-hour stretch. I take tiny breaks during this period to grab drinks, go to the bathroom, check my emails, and so on, which help me to refresh my brain a little. Knowing that my goal is to get my work done by noon, however, helps to nudge me back to work when I get distracted. If I really want to start noodling around on the internet, I have to remind myself that I have limited time until my goal is up, and after lunch I’ll have all afternoon to waste time. In the process of cutting down the time it takes me to write a blog post from a couple of days to just a morning, I’ve learned a bunch of lessons. Many of these are specific to my workflow, but you might find them useful as well. I really love listening to Pandora, but I’ve found that switching to different artists all the time tends to affect my workflow negatively. I spend more time skipping or liking tracks and checking to see who I’m listening to than I should. This month I’ve paid for a month of Rdio to test whether listening to full albums will help me to focus better. So far it seems to be going well. Working until noon isn’t a new idea. I’d come across the concept of setting earlier deadlines for yourself to induce focused work before, but I had always thought that it wouldn’t work for me. After all, if I tell myself I have to have something done by noon, how do I block out the little voice in my head saying, I know that’s a lie and I actually have all day to do this so I’m going to check my email again? Turns out, the trick is not about lying to yourself at all. For me, it’s about setting a challenge. Rather than telling myself, I have to have this done by noon, I tell myself, let’s see if I can get this done by noon – that’d be awesome. Working on a challenge that offers a big reward (more time to do what I want in the afternoon, and no last-minute scramble to finish my work) is a lot more fun and manageable for me that setting arbitrary deadlines. One of my biggest issues with getting blog posts written quickly has always been that they appear to be huge, audacious projects in my mind. I wrote once before about my process of breaking down each post into subtasks that were manageable chunks of work. Although this helped, I still approached each one as a massive project, rather than just another task on my list. Now that I’ve proven to myself over and over that I can write a post in a morning without dropping my quality, they’re a lot less formidable in my mind. I think that makes a huge difference to how I work. I said before that I’ve tried working early in the morning, late at night and right after lunch. I tested a lot of theories about how I work. I’ve worked surrounded by people, all alone in my house, at coffee shops, in silence, in dark spaces and light, when I’m cold and hot. Experimenting has been totally worth it for me, because I’ve found a system that works really well now. It’s taken a lot of time, though, and if I went back in time to when I started at MarketHive, I’d tell myself to be patient and keep experimenting. Something I’ve learned from experience and from reading advice from other writers is that there comes a point when you need to shake yourself out of research mode and force yourself to start writing. Getting words on the page is that huge push that it takes for a boulder to start moving. As soon as you get that done, you’ve got the momentum to keep going. Quite often I’ll get stuck at this stage and I won’t be able to get words on the page, even though I know it’s what I need to do. I have a few strategies to help with this, and I’ve found that using them to get something started is almost always the push I need to keep going. One way I do this is to type rubbish. I may literally start my first sentence like this: “I have no idea what to write about this topic because…” and just type gibberish about the topic and why I’m struggling. Many people have said that writing is important for thinking because it helps you to organize your thoughts. In my case that’s often the case. I never turn my phone off when I’m writing. This means that anyone with my phone number can call me or send me a text message. That hardly ever happens, so it’s not something I’m worried about distracting me. Email and Twitter, on the other hand, can be huge distractions. The problem with notifications from those is that they’re never urgent. I know that anything I urgently need to take care of will come via my phone from something who actually knows my phone number. No email or Tweet is ever going to be so important that I have to stop working immediately to deal with it. At least not when I’m working in a four-hour stretch, and checking my email every hour or two. Not only do I turn off notifications, but I keep Twitter and my inbox closed on my computer when I’m writing. If I really want to check them, I need to use my phone, which keeps my computer safe from those distractions until my blog post is finished and I can send it off. That may not work for everyone, but since I’m prone to switching tabs constantly to see what’s going on, I enjoy the freedom of having no interactions available on my computer. One thing I mentioned earlier was that I struggled to balance my writing at MarketHive with all of the other tasks I had each day, like replying to blog comments and emails, or jumping into support. I’ve been able to focus more easily in recent months because I stopped doing all of those tasks when I switched to a part-time employee. I think there’s still a lesson to be learned from my struggles though, which I expect I’ll face again in the future. Because I always had trouble balancing my “big task” of a blog post and my “little tasks” (everything else), my next experiment with these would be to try pushing all of my little tasks onto one or two particular days per week. Even when I tried doing my blog posts first thing in the morning, I still had trouble balancing the different mindsets needed for different types of work. I think having an entire day blocked out for one type of work would make me more productive and remove the pressure of worrying about the tasks I’m not making progress on. I am thrilled to be able to take all of these lessons away from my time at MarketHive, and to move on to new things with a better understanding of how I work best. MarketHive has an awesome culture for someone like me who enjoys experimenting with their workflow and routines to learn what works best. If you have the flexibility to do so, I’d highly recommend experimenting with your own workflow and taking note of what works and what doesn’t. Or maybe you’ve done some experiments already. Let us know what you’ve found in the comments.